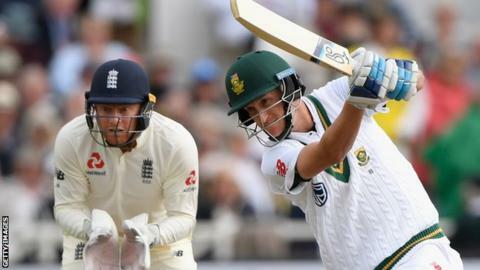 South Africa recovered from a four-wicket burst by England to leave the second Test delicately poised after the first day at Trent Bridge. Stuart Broad (3-47) and Ben Stokes each struck twice to reduce the Proteas from 179-2 to 235-6. But Vernon Philander made 54 in an unbroken partnership of 74 with Chris Morris to leave the visitors 309-6. Hashim Amla (78) and Quinton de Kock (68) put on 113 while James Anderson took his 300th Test wicket in England. In helpful conditions, England were thwarted by some determined South Africa batting in the morning session before Amla and De Kock dominated the afternoon. The post-tea burst looked to have put England on top, but Philander and Morris saw off 10 overs with the second new ball to put South Africa in position to reach a total in excess of 350. On a slowish pitch, England did not always exploit the available movement in the air and off the seam until some loose South Africa batting allowed the home side back in. From the first ball after tea, De Kock played a waft at Broad and was held at first slip by Alastair Cook, then Amla inexplicably hooked a bouncer from the same bowler straight to deep backward square leg. Stokes then saw Du Plessis brilliantly caught down the leg side by a flying Jonny Bairstow, with Temba Bavuma edging behind when attempting a leave. England were on the charge, only to be halted by Philander, promoted to number seven, and the recalled Morris. Absorbing the pressure and driving when given the opportunity, the seventh-wicket pair were largely untroubled in the evening sunshine. Anderson had Dean Elgar well caught by Liam Dawson at point on an attritional morning, while Broad got Heino Kuhn to play on to his stumps just after lunch. Until then runs were not easy to come by, but De Kock, elevated to number four, sparkled with some wonderful strokeplay. The left-hander played drives on both sides of the wicket and cuts behind square in a 59-ball half-century. Amla, dropped on 56 low by Cook at first slip off Stokes, was more circumspect, but played elegant cover drives of his own and a loft down the ground for six off the left-arm spin of Dawson. Their third-wicket partnership rattled along at more than 4.5 runs per over and they looked set to take the game away from England before both played poor strokes. Root enjoyed a serene time in his first Test as captain, a 211-run win at Lord's, and said on Thursday that he was looking forward to when he would be challenged. One learning curve will be the use of the review system. Both of England's referrals were gone within 24 overs, with Stokes and Broad respectively demanding reviews that were wasted on unlikely lbw shouts. Root may also ponder the make-up of his attack, specifically the spinners. England were adamant after the first Test that Moeen Ali was a second spinner behind Dawson and so Moeen, who took 10 wickets at Lord's, was not used until the 45th over, while his fellow slow bowler looked ineffective in seven overs for 26 runs. Root did successfully move Broad from his favoured Pavilion End to the Radcliffe Road End to spark England's resurgence, but the hosts allowed the game to drift as they waited for the second new ball to arrive, a period that allowed Philander and Morris to settle. Former England captain Michael Vaughan on Test Match Special: "I think England bowled too short. The drives that went to the boundary went square so they were full but too wide. I don't think the bowlers hit off stump often enough. "Morris and Philander's partnership has given South Africa the day. I would much prefer to be in their shoes." England wicketkeeper Jonny Bairstow: "It is pretty even. We would have taken that last session. They were in front at tea so we will take four wickets in the final session. We will be in with a chance in the morning. The ball didn't do as much in the afternoon as the morning. We had some luck and needed it. Asked if the England bowlers bowled too short: "I don't think so. We were trying to attack off stump. If you pitch it up too much you get driven for four." South Africa's Quinton de Kock: "I would have liked to have kicked on. I seem to be getting a lot of starts and not finishing the job, but that's cricket for you. "We needed Chris and Vernon to come through for us, we were under pressure and for them to bat like that was much needed and heads are high."